3 Beautiful spots for snorkeling ,Dolphin cruise ,Lunch at sand bank ,free water and soft drink. 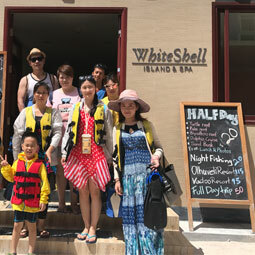 Lets Snorkel with friendly giant shark and lunch at local Island. Snorkeling with dolphins. Catch fish and enjoy the sunset on the boat ,free BBQ dinner. Need to arrange trip minimum 4 pax (trips duration 1 hr). Whole day visit to neighbouring resort and experience the resort life. BBQ lunch at picnic isaland, dolphin cruise, snorkeling around the picnic island.